Every year, a number of local government water and/or wastewater enterprise funds report lower revenues than expenditures in their audited annual financial statements. These deficits may have resulted from lower-than-expected water demands and sales, or unanticipated expenditures, or low rates, or for one of many other reasons. 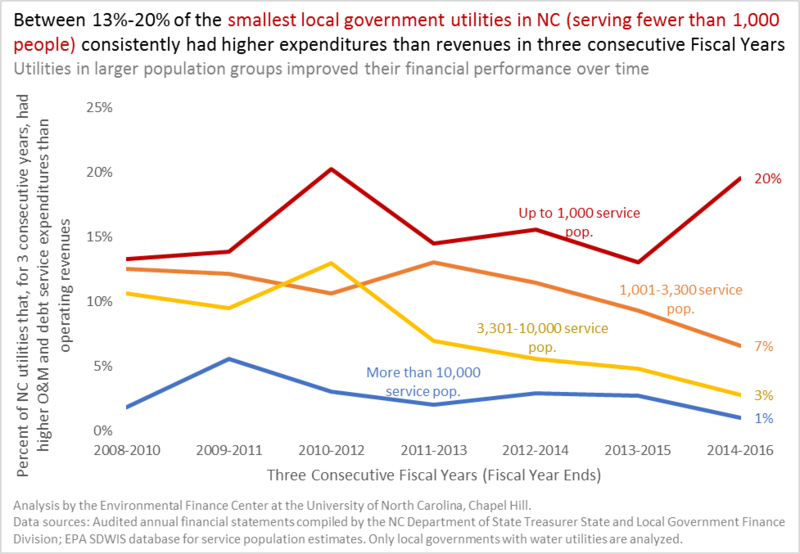 In North Carolina, between 19% and 37% of local government utilities had deficits in the years between FY2008 and FY2016. The majority of these cases were deficits that only lasted one or two years. However, during this period, between 9% and 12% of local government utilities had deficits in three consecutive years, which I will call “sustained deficits” here. Not surprisingly, more of the smallest local governments had these sustained deficits than larger local governments. Because the water/wastewater industry is capital intensive, small utilities have high fixed costs that are split between very few customers, making it very difficult for small utilities to charge rates that would adequately cover their costs of service (also, worryingly, small water systems with financial difficulties are more likely to violate EPA regulations). Small utility rates are usually higher than rates charged by large utilities. Nevertheless, after three years of inability to pay for all of their operations and maintenance costs and debt service (not even including cash-financed capital projects) through revenues collected from customers in those years, the utilities most likely will need to raise their rates the following year or else risk further deficits if expenditures are not significantly reduced. Like in many other states, in North Carolina local government governing bodies (i.e. City Councils, County Commissioners, Authority Boards, etc.) have the ultimate responsibility of setting and adopting the water and wastewater rates. Rate increases are very common in the State of North Carolina. 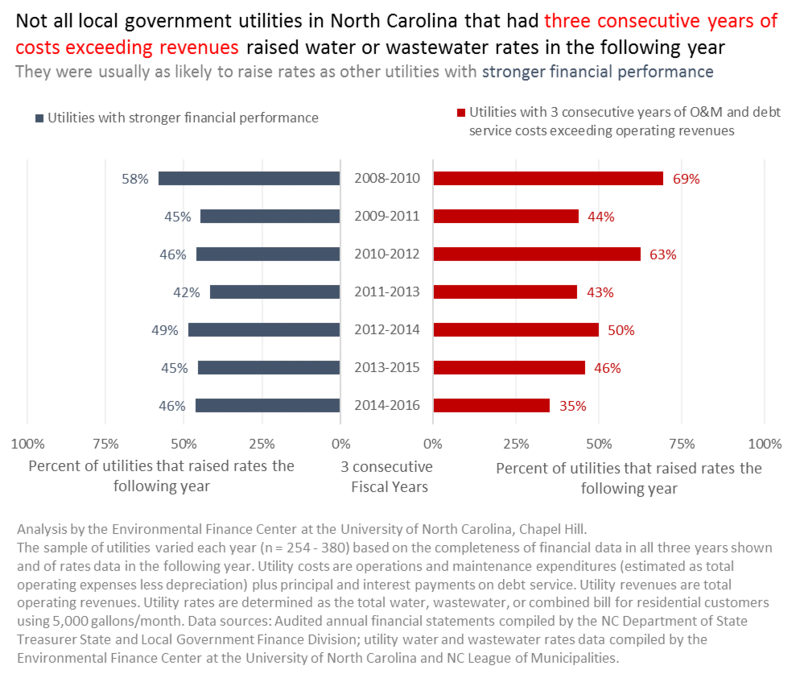 Typically, about half of NC local governments raise water/wastewater rates from one year to the next, and about two-thirds will have raised rates at least once in the previous two years. Given how prevalent rate increases are in the state, and given the strong need to raise rates in communities that have had three years of deficits, one might expect that utilities with sustained deficits are more likely to raise rates the following year than other utilities that are in stronger financial positions. However, that was not the case in the past few years. Only 35% – 69% of utilities with three-year deficits raised rates the following year, compared to the 42% – 58% of all other utilities that raised rates in the same period. Only twice in the last seven years were utilities with sustained deficits more likely to raise rates than other utilities. Ideally, every utility with three years of deficits would raise rates the following year if it cannot reduce costs. Raising rates would theoretically lower the risk of another deficit from occurring the next year (the fourth year in a row). The statistics support this. Between FY2010 and FY2015, utilities with sustained deficits that raised rates were 35% more likely to avoid a deficit for a fourth year than utilities with sustained deficits that did not raise rates. So why would a utility that evidently needs a rate increase not raise rates? There are potentially many obstacles to raising rates. Rates may already be high relative to the communities’ ability to pay (in fact, utilities with sustained deficits were typically already charging higher rates than utilities without deficits). There may be general reluctance from the governing body to accept and adopt rate increases (leading to many utilities requesting approvals for rates that are not sufficient to pay for all costs). Some utilities may be intentionally or unintentionally taking a risk that water demands – and thus revenues – will increase the following year or that costs will be reined in, or they may be covering their deficits from high reserves or through other sources besides their operating revenues. A few utilities may be unaware of the extent of their deficits, or unable to dedicate the resources needed to determine how high rates need to go in order to avoid further deficits. For many local governments, this is the start of the “budget season” during which rates and charges are reviewed and new rates are proposed. 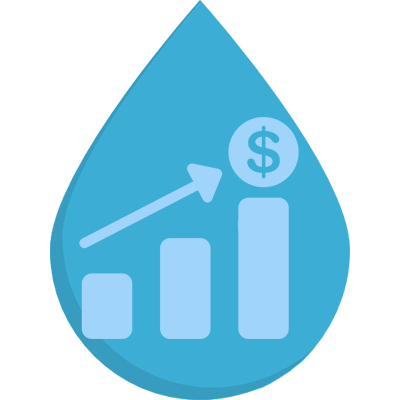 Utilities are encouraged to assess their financial performance not just in the last fiscal year, but in the last five or more years in order to detect long-term trends (you may choose to use the free Financial Health Checkup for Water Utilities tool for this purpose). Rates consultants and technical assistance providers are available to assist local governments in reviewing their rates, or you may use do-it-yourself decision-making tools, such as the Water & Wastewater Rates Analysis Model, to help you test scenarios of your current and multiple proposed rates to ensure that they can generate sufficient revenues next year. If you decide that a rate increase is needed, there are 10 tips for getting higher rate increases approved by the governing board, and related toolkits to help. It may help to compare your rates with other utilities’ rates using one of several states’ Rates Dashboards, or to assess the affordability of your current or proposed rates on your residential customer base. There are many other free resources and tools available for utilities to use, with particular focus on assisting small water systems. For the purposes of this analysis, “revenues” means total operating revenues, and “expenditures” means expenditures on operations and maintenance (calculated as total operating expenses minus depreciation) plus principal and interest payments on long-term debt. Additional expenses, such as cash payments for capital projects, are excluded for simplicity. A “deficit” is defined here as having lower revenues than expenditures, as defined above, in a fiscal year. Audited annual financial statement data from more than 460 local government water/wastewater enterprise funds are collected and compiled by the Local Government Commission in the NC Department of State Treasurer’s State and Local Government Finance Division. The data were analyzed by the Environmental Finance Center at the University of North Carolina, Chapel Hill. Interested in a Water Public Private Partnership? Start with Realistic Expectations!